"With the new Grade Guidance option, our customers can dig confidently and enhance their efficiency. Instead of spending time on the guesswork that goes into achieving the right grade, Grade Guidance monitors it in real time, so our customers can get the job done quickly." "We're thrilled to offer this option to our customers," said Jonny Spendlove, product marketing manager, excavators, Hitachi Construction Machinery - Americas. "With the new Grade Guidance option, our customers can dig confidently and enhance their efficiency. Instead of spending time on the guesswork that goes into achieving the right grade, Grade Guidance monitors it in real time, so our customers can get the job done quickly." The new option is now available on the ZX210-6 & ZX210LC-6 and ZX350LC-6, and will be offered on additional Dash-6 models in the future. Supported by Hitachi’s reliable dealer network, Grade Guidance is installed and calibrated at the factory, so it arrives on jobsites ready to work. From trenching and shaping ditches and slopes to digging foundations, Grade Guidance helps increase efficiency on a variety of projects. The real-time display of distance-to-grade reduces time to final grade, so jobs can be completed quickly. A real-time grade indicator also allows for grade management without leaving the cab, and reduces the need for a grade checker or grade stakes. Supported by Hitachi's reliable dealer network, Grade Guidance is installed and calibrated at the factory, so it arrives on jobsites ready to work. 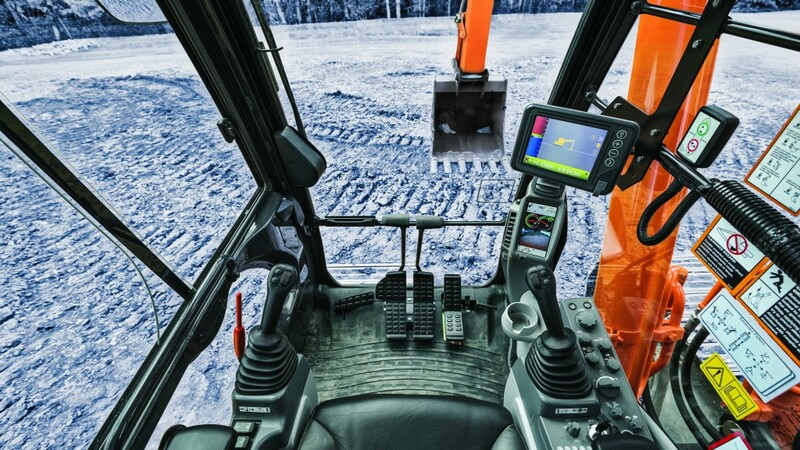 Full integration into the machine's cab and structures helps shield key components such as wire harnesses and sensors from damage while also providing effortless control with conveniently placed joysticks to enable easy fingertip control. Customers can choose 2D Grade Guidance or 3D Grade Guidance. The 2D Grade Guidance with an optional laser receiver displays the elevation of the cutting edge in relation to a reference plane while the 3D Grade Guidance with Global Navigation Satellite System (GNSS) displays position and elevation with respect to a global reference. System data from both options can be sent to ZXLink™ for analysis, so the machine's health can be monitored to keep projects up and running. In addition to the new factory-integrated Grade Guidance, Hitachi offers an open architecture option that includes sensor mounting brackets to enable installation of a Trimble, Topcon or Leica aftermarket kit.